Originally from California, where there are no flashing fireflies, Sarah vividly remembers the first time she saw the displays of these enchanting insects during her PhD work at the University of Georgia. 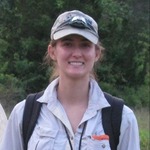 An evolutionary biologist, she is fascinated by firefly biology and genomes. Recently, you may have heard her on NPR's Science Friday discussing the evolution of firefly flash color. She enjoys hunting for fireflies while hiking with her new puppy, Bjorn. I loved Abner's talk at the last Firefly Symposium. Thank you for letting him know. Thank you so much Colette! Glow on! Do you have a website? We are excited too! The possibilities are endless! To go along with Tim's comment, in a preliminary study, sequencing of washed firefly thorax (of a different, but related species) resulted in only 1.1% percent microbial/viral contaminants. So washing is a great idea! Interestingly, Photinus pyralis adults are not known to eat, though they seem to consume water when kept in the lab. Larvae, on the other hand, are voracious predators and prey upon snails and earthworms in the soil. Hi Misha, Both Amanda Larracuente and I have tried this- laying is no problem in the lab, but it is difficult to get the larvae through the first few instars. We are still working on it. Hi Misha, Our genome size estimate was obtained with flow cytometry of propidium iodide stained nuclei from neural tissue in collaboration with Spencer Johnston at Texas A&M (see Tim's link below).